If you’re a child of the ‘90s, you know that power couples became a thing when Brad and Angelina melded into Brangelina. Modern power couples include Kimye, Bey and Jay, and George and Amal. But don’t forget the *true* power couple of 2016, Hillary and Bill Clinton. This couple may be the first couple in US History where both wife and husband were presidents. If that doesn’t say power couple to you, I don’t know what does. So for Halloween, dress yourself and your S.O. as the Clintons! If you’re extra ambitious, grab a couple friends to dress up as Bernie and Trump for the ultimate politically savvy squad. The nice thing about this couples costume is that you and your S.O. probably already have most of what you need in your closet. If not, you can pick up business-like outfit pieces at lots of places. Let’s get started! 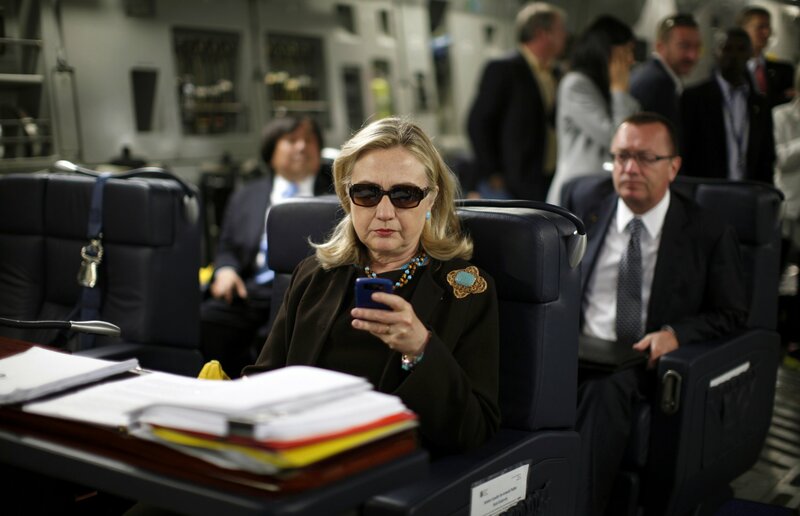 I modeled Hillary’s outfit after the viral photos of her staring intensely at her cell phone. I bought a black shirt from a thrift store and from Amazon, I bought a black HyBrid & Company Blazer ($25) and a black Simlu Pencil Skirt ($18). I made Hillary’s necklace by stringing turquoise beads on a string. I strung smaller turquoise beads on earring hooks to make her earrings. I also bought sunglasses from Target. Finally, I bought a Forum Novelties Hillary Clinton Wig ($8) from Amazon. Kit Designer Lee brought her own black flats and spot-on Hillary impression to complete the look. To make Lee look older, Beauty Editor Misty worked her magic. Tips + Tricks to Transform a Young Face into an Old Face: Go lighter on your foundation to get that drab coloring Hillary has and then create the lines on top of that. To get the lines on her face for wrinkles, I had her do things like lift her eyebrows, make an angry face, smile and any other move to help show where the lines would naturally exist if they were there, and then I lined them with a light gray liner. Hillary has a great smile. Don’t bother me; I’m checking the ‘gram. Bill was a super easy costume to make. Our Head of Product, Shanan Delp, brought his own dress shoes, jacket, pants and shirt, so the only thing I needed to get was a politician-like red tie and a wig. I bought a Costume Culture Men’s Silver Fox Wig ($9) from Amazon and a red tie from Ross. Shanan killin’ it as William Jefferson Clinton. Marriage means liking each others’ photos. Balloon party with Trump and Bernie!! Which political icon will you dress up as? Share your photos with us on Instagram using the hashtag #iamcreative and tag @BritandCo. Need even more inspiration? Head to Pinterest STAT.